Evil Dead Remake Promises to be "The Most Terrifying Film You Will Ever Experience"
Yep, the 2013 remake of "Evil Dead" has just revealed its first-ever poster and it clearly promises that this will be the most terrifying film we will ever see. Bold words but who are we to doubt the genius of Sam Raimi and Bruce Campbell combined? If the recently released red band trailer is any indication (which you can catch after the break), "Evil Dead" is on the right path. "Evil Dead" is about five friends who are vacationing in a remote cabin. When they discover a book at the basement and accidentally reads a passage from it, they summon demons living in the nearby woods and one by one they get possessed until one person remains. Clearly, this is one to look out for with great anticipation for horror fans. 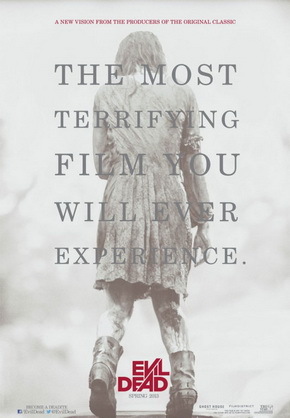 "Evil Dead" opens on April 12, 2013.